When they say peace . . . ? Former Israeli President Shimon Peres has said that Pope Francis is more powerful than the United Nation when it comes to advocating peace . . . 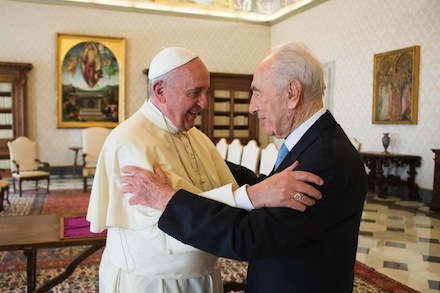 While visiting the Vatican earlier today, Mr Peres asked Pope Francis to head a parallel United Nations called the “United Religions” to counter religious extremism in the world today. And all the world wondered after the Beast . . . ! “And the beast which I saw was like unto a leopard (ref: Daniel 7:1-8), and his feet were as the feet of a bear, and his mouth as the mouth of a lion . . . . And the dragon (Revelation 12:7-9) gave him his power (miracle working), and his seat (breastplate), and great authority . . . .
https://www.youtube.com/watch?v=zvdI64kqWlo – Two Beasts Become Friends ! https://www.youtube.com/watch?v=8Dv4KNsJITc – A Lamp in the Dark, the Untold History of the Bible ! And please help us pray for all those who have yet to see the Light of Truth for these final days before Christ’s return in the clouds of heaven! And let us each one work together to scatter the Truths of God’s Word, as the leaves of autumn, and win souls to the Kingdom of our Lord and Saviour Jesus Christ (Yehushua ha Moshiac) !